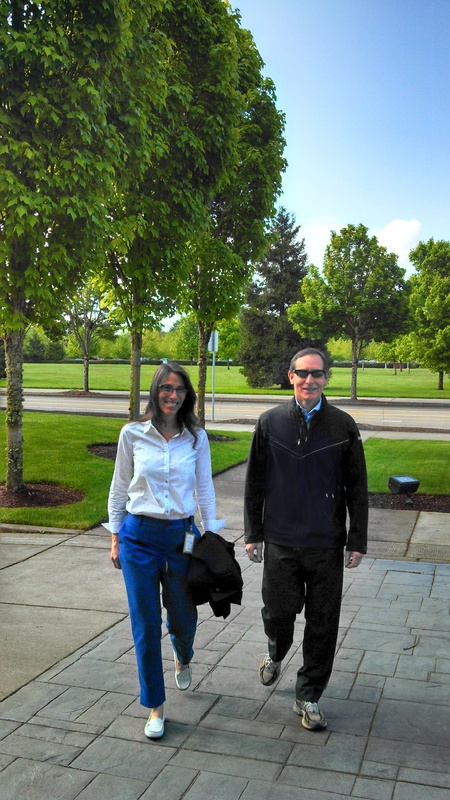 Our newest guest blogger, Marian, is known for her love of walking meetings. Rain or shine, she can be found striding along outside our Springfield office. Besides the great exercise walking provides, Marian now has new reason to get out and moving- science! Take it away, Marian! The sun is shining, but is your creative brain feeling a bit stiff and dull? Then grab those sneakers and take your creativity for a walk! Researchers at Stanford University have determined that walking boosts creative thinking. They conducted a series of experiments comparing people’s level of creativity when walking versus when sitting (like at a desk, in a car, in front of the T.V….you get the idea). And remarkably, people’s creative thinking was improved by up to 60% when they were walking. But wait! Our very own CFO, Peter is an avid “Walking Meeting” guy, so ignore the previous bullet. Other famous “Walking Meeting” folks? The late Steve Jobs and Mark Zuckerberg – so lace up those shoes folks! Extra Credit Quiz: What kind of thinker are you, Divergent or Convergent? Answer: Doesn’t matter, get out there and walk! Adult figure skating – I learn to jump, and I break my tailbone.